Prototype: Swiss Federal Railways (SBB) class RCe 2/4 electric express powered rail car, "Roter Pfeil" / "Red Arrow", 3rd class, with a single-axle ski trailer. Crimson basic paint scheme. Road number 604. The rail car looks as it did around 1948. 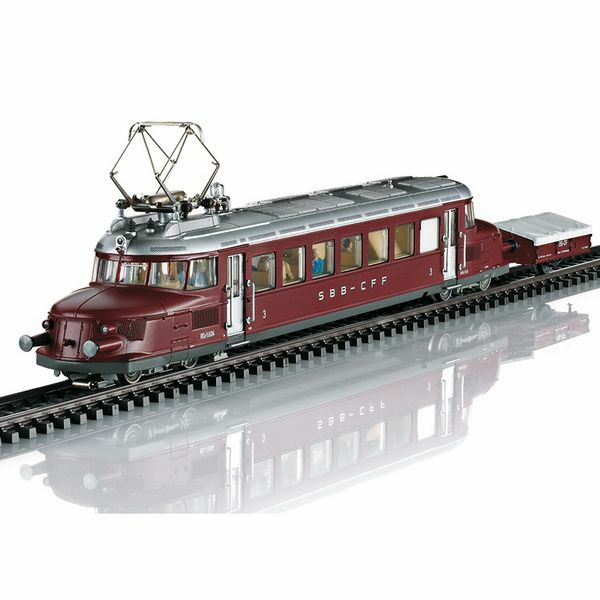 Model: The powered rail car has an mfx+ digital decoder and extensive sound functions. It also has controlled high-efficiency propulsion. The powered rail car has a special motor with a flywheel and a cardan shaft to the powered truck. 2 axles powered. Traction tires. The Swiss light code, 3 headlights in the front and 1 white marker light, changes over with the direction of travel, will work in conventional operation, and can be controlled digitally. In addition, the white marker light can be switched to a red marker light. The powered rail car has factory built-in interior lighting. Maintenance-free warm white LEDs are used for the headlights, white marker light, and the interior lighting and a red LED is used for the red marker light. 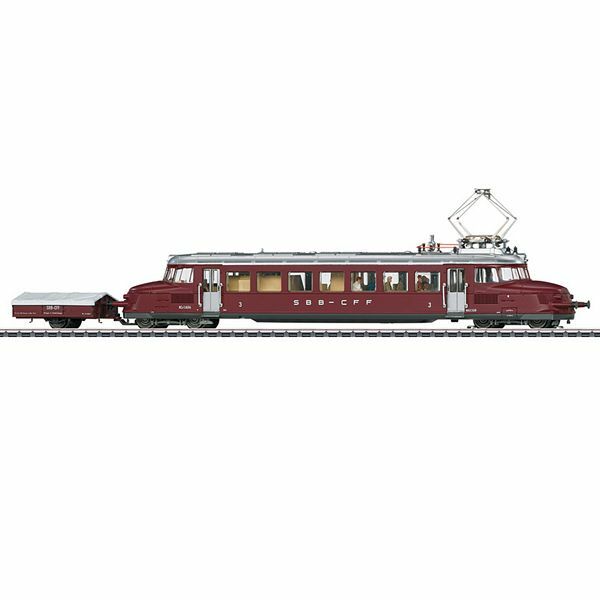 This powered rail car comes from the factory with a figure of the driver and numerous passengers. In addition, different background sounds can be activated by means of the function buttons. The powered rail car has a single-axle ski trailer with a special coupling to it. Total length over the buffers 31.5 cm / 12-3/8". Warm white LEDs for the headlights and interior lighting. Can be switched to a red marker light. Passengers already seated in the car. "World of Operation" mfx+ decoder and extensive sound functions included. This model can be found in a DC version in the Trix H0 assortment under item number 22867. Triple headlights and a white marker light that change over with the direction of travel. Triple headlights and a red marker light that change over with the direction of travel.